Watch our Mokara Wallcovering video. Featuring a horizontal emboss texture with a faint metallic tip print, Mokara is a tactile wall solution that embodies casual elegance. Exclusively from LEVEY. Available in a stunning array of 20 colour variations of design-friendly neutrals and vibrant accents, Mokara is a versatile addition to our DeNovo Wall collection of Type II commercial vinyl wallcoverings. 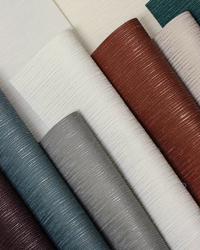 Heavily textured upon a woven backing, Mokara helps prevent the telegraphing of wall imperfections and is an ideal wallcovering solution for high traffic projects that require added wall protection, ultimately resulting in life cycle cost reduction. 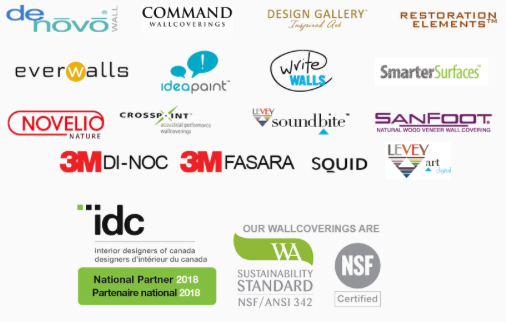 This highly durable commercial vinyl wallcovering passes the high fire safety standards of CAN/ULC S102.-10 and ASTM E-84 required for public spaces.